Thank you so very much for this. I am ecstatic that these exist. I love when Conner enters the wherehouse and Katana is baiting him with a speech not heard in other edits as he searches for him. There was once some cool covers but I have been unable to locate them as of late. All of the cuts include the best possible sources at the time. Some were sourced with VHS, BETA, LD, DVD, Bluray, workprint, 16 mmm source and what ever else we could find. It was a long process and we enjoyed that time in or lives. Many helped us includeing Fanfiltraion and a few others that I forget but are noted on the discs. Some of the deleted scenes are in poor shape though. A dumb question - what did happen to all the promised extras - the alternate commentary track, the promo photos, the 3D stuff, the production footage ... Was it ever released? I'm asking because I found out none of the stuff is on my copy and now I don't know if I just have one of the previous versions or if FanFiltration changed his mind and didn't release it? After the years and years of Fanfiltration making the restoration. It was found that the film itself was more important than the extras. However, he does have a few cool extra's on the disc. My thought to you is, what is stopping you from taking his film restoration and creating your own disc set? Lot's of people here have done that with no problem and usually the fan creator, fan editor, or restoration editor has not problem with that as long as they get credit somewhere on the disc. Someone is germany recently took my Extended Zeist Version and created a German only and German only audio and used German extra's and created there own disc. Mitch, I cannot say what will be there in terms of video as I am only doing the isolated music track. Of course it would be good to know so perhaps someone else who is working on the video area will be able to answer your question. Sorry I can't be of more help to you. Oh, sorry! How many people are working on this? So glad you answered my question earlier. Must have been a difficult question. does this one have the Star Wars type credits at the start of the film. Forgive me for not reading back. my VHS I have i bought a long, long time ago has that. I am hoping cause that's the way I remember it. I am a person who grew up with an Italian Grandmother. So I can understand some Italian. So I am hoping you can provide a ENG subtitle also. This would help since I might not be able to understand all words. So people can also expierence the Italian Audio but want ENG subs. 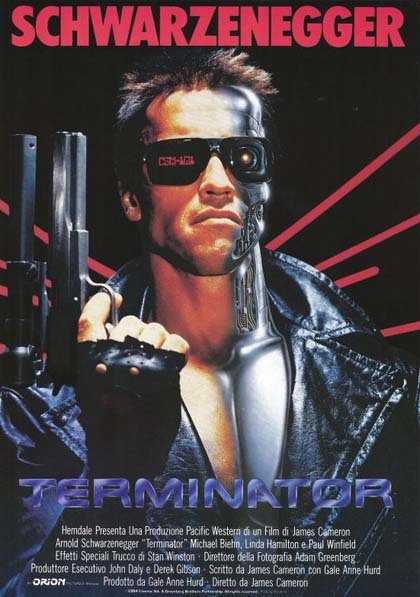 It's not like any of you ever bought an Italian poster for Terminator, have you? Anyone wanna talk about preservation/fan edits on my podcast? No one is going to listen to your podcast with attitude like that. I for sure WILL not pass the word. This is the podcast of UUpodcast, not TV's Frink or Jetrell Fo. UUpodcast didn't catch an attitude with you. I have no idea what exactly happened here, but sorry to be the one to host all of this? This kind of thing happens all the time here, actually, so don't worry about it. One guy who never gets out of this particular subforum does not a forum make. Yes, and your a saint... Really? Apology again to the thread and UUpodcast for littering this thread with rudeness and hate. Well that's weird. I just tried to correct your misunderstanding of how podcasts work and that there was no way you could "miss" the live recording unless you were invited to be a part of it. I don't recall any hate, or really any rudeness, though I suppose that's in the eye of the rudeholder. But at any rate, in the spirit of loving and kindness and puppy dogs, I forgive you for not understanding this earlier. You just do NOT quit do you? Unreal! What do you believe is the problem with my signature? I don't think this has ever happened in the ten plus years I have been a member. I also do not think I have been bashed for spelling or grammar on here before either. This is usually a friendly message board and it is not a writing assignment. I don't think anyone has ever got in an argument or has been rude to me before. In fact i can't even remember an incident between other's either. Anyhow, I am moving on. Apology again to the thread and UUpodcast for littering this thread with rudeness and hate. I guess someone just didn't take kindly to me, but that's ok! Mitch, did the T1 uncut / extended included all the deleted scenes, or just some of them? If you remember what was back in, it would be easy to redo this cut in FCPX or any other editing software. if I remember right it was the actual DVD with Menus but whne you put the disc in it said, play with seemless branching or without. The rest of the disc was the special edition version. so it exsisted cause it was the only way i watched it for some time. if anyone has this disc, please let me know.